Protein bars have always been a great on-the-go snack or meal replacement for many trying to get in shape or build muscle. But when you’re on the ketogenic diet, most of those protein bars become outlawed because they contain too many carbs. On the ketogenic diet, low carb protein bars are a great way to have the best of both worlds. They provide a healthy snack that gives you the flavors you crave with just the right balance of nutrients, including protein. After all, too much protein can also derail your progress on the keto diet. If you’re new to the keto diet or simply looking to find a protein bar to fit your keto lifestyle, check out these tasty low carb protein bars that will keep you in ketosis. Created by Dr. Anthony Gusin after 14 attempts, these low carb protein bars were a labor of love. Dr. Gusin monitored his own blood glucose levels so that he could perfect these Keto Bars which keep your net carbs in check while keeping you from becoming hungry, or even hangry. The flavor is both sweet and salty while giving you nutritious ingredients like collagen protein, soluble tapioca fiber, and sunflower lecithin. Organic almond butter, organic cocoa, cacao butter, and sea salt round out the roster. There’s no added sugar or artificial preservatives to worry about either. Stevia adds sweetness while keeping blood sugar levels under control too. Perfect Keto Keto Bars are also gluten-free and dairy-free. This low carb protein bar only contains 3 grams of net carbs while keeping you feeling balanced and energized to keep doing what you do best. Because it’s so delicious, it’s easy to eat and enjoy. Plus, your body finds it easy to digest. As the name suggests, this low carb protein bar truly resembles a brick, only one that is much more delicious. 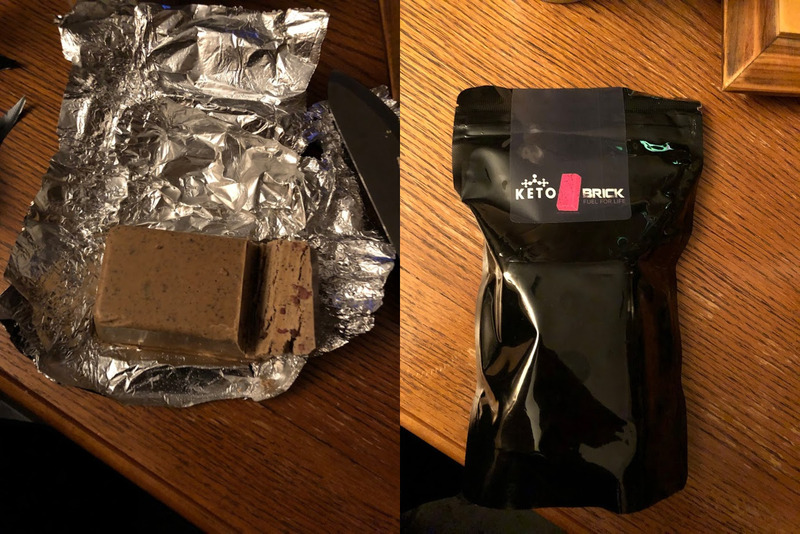 The Keto Brick is considered a complete meal in one bar. Created with perfect ketogenic macros, it is designed to fill you up without overloading you on carbs. For those that are very active from running to cycling to hiking, this low carb protein bar will definitely have your back. It contains 81.5% fats, 12.5% protein, and 6.5% carbs, which is 4 grams of net carbs total. This tasty bar is made from raw organic cacao butter to deliver antioxidants, vegetable-based protein that’s soy-free and includes BCAA’s, pure MCT powder for medium chain triglycerides, ground flaxseed to give you omega fatty acids plus fiber, raw organic cacao nibs for a phytonutrient boost, ground coffee beans to perk you up with natural caffeine, and pink Himalayan salt for those necessary minerals and electrolytes. Be aware though that this bar is not merely a snack. At 1,000 calories, it is a meal in and of itself, one that is composed to satisfy your hunger as well as your nutritional and dietary needs. For a ketogenic-friendly low carb protein bar, Quest is another great snack choice. It has quite a bit of fiber in it though which can really help things move along in your digestive system. Made with coconut, almonds, cocoa butter, and dark chocolate, it’s tasty and healthy. In each Quest Bar, you get 13 grams of fiber, 21 grams of protein, 8 grams of fat and only 4 grams of net carbs. So it has everything you need to quell your snack hunger rage without overloading your carb intake. It’s only 190 calories too, which makes it easy to balance in during a busy morning or afternoon, or something to munch on pre-gym. You can also use it to replace a meal as long as you round out your other meals appropriately for your keto-based lifestyle. It’s gluten-free and soy-free, but unfortunately, it contains sucralose which is an artificial sweetener, the same used in Splenda. That doesn’t add to the calorie content and it’s still a keto-friendly low car protein bar, but for those that want to avoid artificial sweeteners, you may want to try something else. This low carb protein bar makes it easy to balance that protein-fat-carb ratio that you need to get into the ketogenic diet. It’s a great choice for those just starting out into the world of keto. These bars contain 9 grams of protein, 8 grams of fiber, 16 grams of fat, and 5 grams of net carbs, offering the perfect balance. The unique formulation helps with fat loss. It also contains coconut MCT oil, a great ingredient that adds benefits for the health of your brain as well as your heart, all while preventing obesity. Gluten-free and soy-free, and without added sugar or preservatives, it fits your keto lifestyle. Additionally, if you are athletic or into sports of any kind, this low carb protein bar will give you the boost you need. On the downside, some people dislike the way it tastes, especially compared to other low carb protein bars. Give it a try though. You might just find you love it! If you originally embarked on the ketogenic diet because you are diabetic or you’re trying to take control of your blood sugar level, KetoSlim offers a perfect balance. Each bar has 2 grams of net carbs and is filled with 21 grams of whey protein. There are metabolic enhancers too that will help you burn calorie and fat. Here’s where KetoSlim is different from other low-glycemic protein bars…they taste great! That’s because they aren’t glycerin-based so there’s no unpleasant aftertaste. It is made with whole food concentrates from over 45 fruits, vegetables, and green foods to support your body’s nutrition which leaves you satiated long after you eat it. It has rave reviews though some may experience gas or bloating the first few times they eat one. Missing dessert? Keto Brownie Almond Crunch is just what you’re looking for. It contains a high protein content at 11 grams and features low net carbs of just 4 grams. With 16 grams of fiber and 16 grams of fat, it is perfectly balanced for the ketogenic diet. The ingredients are completely natural and organic, giving you the ketogenic macro-nutrients you need to sustain your lifestyle. Plus, they’re easy to digest. They live up to their name too. With “Brownie Almond Crunch” in the title, you may hesitate to get excited. Will it taste like some chalky food substitute? The answer is no. In fact, they taste so close to a real brownie treat you’ll likely do a double-take. The taste and texture are extremely palatable, allowing you to satisfy your sweet tooth while sticking to your ketogenic diet goals. They are pricier than other options so perhaps try one and see if you like it enough to overlook the cost. Another delicious option for low carb protein bars are Stoka Bars. 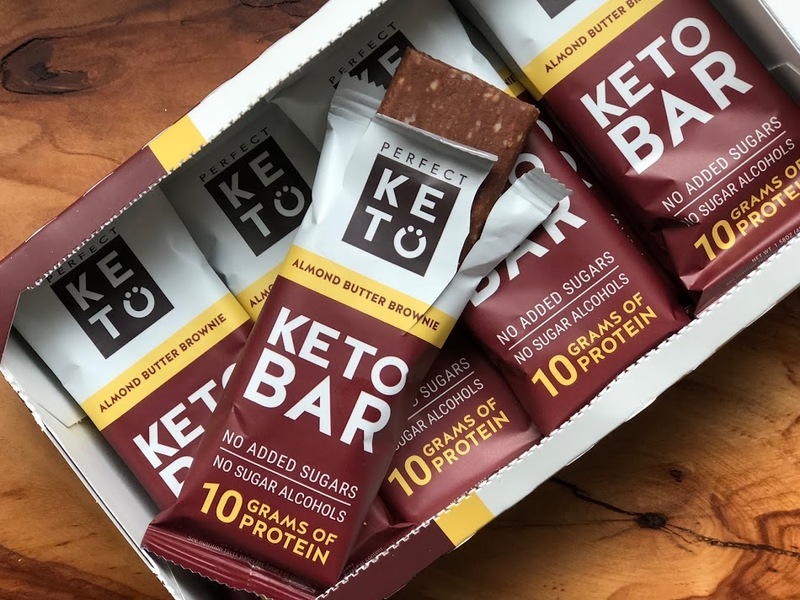 These keto-friendly bars are formulated to help keep you in ketosis. They have 9 grams of protein, 5 grams of fiber, and 4 grams of carbs. The ingredients are completely natural too. You’ll find almonds, psyllium husks, stevia leaf extract, and sea salt. They taste great with a filling and delightful flavor while keeping you feeling satiated for long stretches. There are no GMOs, plus it’s soy-free, gluten-free, and whey-free for any of your other dietary concerns. It hits all the right notes though there aren’t very many of them in a pack. Still, they’ve made many keto dieters happy and helped them keep their goals. For those of you that worry about eating clean and avoiding processed foods, the Atlas Bar is for you. This low car protein bar is keto-friendly and super clean. It contains 15 grams of protein, 13 grams of fiber, and net carbs at just 6 grams. The ingredients are high-quality and transparent with Himalayan pink salt and grass-fed whey. Nothing artificial is in these. There are no chemicals, pesticides, or hormones. It’s just pure healthy ingredients from nature. Free of gluten, soy, and GMOs, this protein-rich bar makes a great snack or meal replacement with a delicious taste to go with it. The intense quality and natural ingredients don’t come without a price though. These are one of the most expensive options out there, but if pure and clean eating is important to you as you keep up with keto, then these will be worth it. Protein bars make a great choice for fueling you pre-workout, as a snack, or even to replace a meal, however not every protein bar out there is right for the ketogenic diet. Most of them have a high carb content which is often overlooked as the protein content is touted. That’s why choosing low carb protein bars like the ones on this list are the only way to enjoy them without getting out of ketosis. These give you the right amount of protein without added sugar, making it easy to stick to your keto diet. If you’d like to try any protein bars that are not on this list, make sure you read the labels first and check them out before taking a bite. Generally, you can eat low carb protein bars at any time, but the best times are when you want to use them. You can eat them instead of breakfast which is an ideal solution for those on the go. You can also eat them between meals as a snack. This keeps you from eating unhealthy things, especially if you work in the kind of office that has donuts, cookies, chips, and other temptations all around. Low carb protein bars are also ideal to replace any meal. Unlike low-cal alternatives such as those shakes that leave you famished, these have everything you need to help you feel satiated while giving you plenty of nutrients to keep your body healthy. You may also find that eating one before or after your workout is a good time. If you’re going to eat one beforehand, try to do so one to two hours prior to boost your energy. Afterward, these low carb protein bars can help repair your muscles post-workout for faster recovery. Moderation is always important with anything. Replacing a meal with one or eating one as a snack in the same day is generally fine, but much of it depends on the ingredients, serving sizes, and calories to see how many low carb protein bars you should eat in a day. Some, like the Keto Brick for example, are high in calories as they are designed to keep you sustained for long periods. You must take those things into account before you mindlessly munch on them. Eating them in moderation can be a healthful supplement to your diet. Especially if you have no time to eat a meal on the go and your only option is fast food, keeping a low carb protein bar in your bag is an ideal solution. Choose the low carb protein bar that’s best for you based on the total calories, particularly if you want to lose weight. You’ll also want to look at the net carbs. Remember, you must subtract the fiber content from the carbs to get the net carbs. Keeping that net carb number low is the key to staying in ketosis. Watch for added sugars and always read the labels to be sure you know what you’re getting into. And remember, even the healthiest of low carb protein bars might not be for you. The ones on this list are worth a try, but always be aware when buying them what they include and how they can help support your ketogenic lifestyle. If you haven’t joined our Killing it with Keto Facebook group you are really missing out!